Australian Dance Theatre’s Be Your Self only premiered in 2010 but its first performance in Melbourne was a reminder of how much an art form can shift in a relatively short time. It’s a bravura work, riddled with ambition and rewarding on multiple levels, yet every so often a moment arises that has a viewer thinking: oh yeah, that’s what dancers were doing back then. This isn’t a criticism. If anything, it puts into relief the many sequences and images in this work that are as fresh as anything debuting in 2017. It’s a piece that juxtaposes the organic and the mechanical, with a soundtrack machine-gunning from power drills to hoarse coughing and bodies that go from almost superhuman feats of athleticism to become fragmented and devoid of human identity. The realisation of some of these themes is already a bit dated — masks of faces on the backs of heads aren’t as uncanny as they might once have been, and muscle-locking to produce an artificial strobe effect doesn’t feel fresh. The work as a whole doesn’t suffer, however, because Be Your Self is stuffed with so many ideas per square inch that there’s no time for your attention to drift elsewhere. The work begins with a dancer performing a simple leg extension while another performer provides a precise medical description of the various biological processes that are occurring along the way. It’s an onslaught of information for such an unimpressive move, and immediately announces the unconvertibility of dance into mere language. What follows is hugely physical dance: I don’t think I’ve ever seen such a muscular production in Melbourne, where dancers tend towards leaner frames, and the strength on display here is at times jaw-dropping. If the choreography emphasises the ability of a highly trained body to accomplish things mere words cannot capture, by the work’s end these bodies have become so isolated in terms of muscle groups and formation that they are literally in pieces. Emerging from almost invisible slits in an angled wall, they are dismembered limbs and decapitated heads bleeding out across the space. Like much that preceded it, this sequence is both lurid and hypnotic, all the more so for a welcome lack of editorial direction by choreographer Garry Stewart, who presents these rich stage pictures without hammering home how they should be interpreted. The Melbourne production was critically underrated, in my mind, and there’s much here that lingers. It’s a work both of its time and outside of it, both intensely material and quietly abstracted. Arena Theatre’s Trapper bears a different but just as curious relation to time. It’s a new work that’s somehow redolent of the past, or at least past visions of how the future looked. It’s a gorgeous production, inviting to the eye. 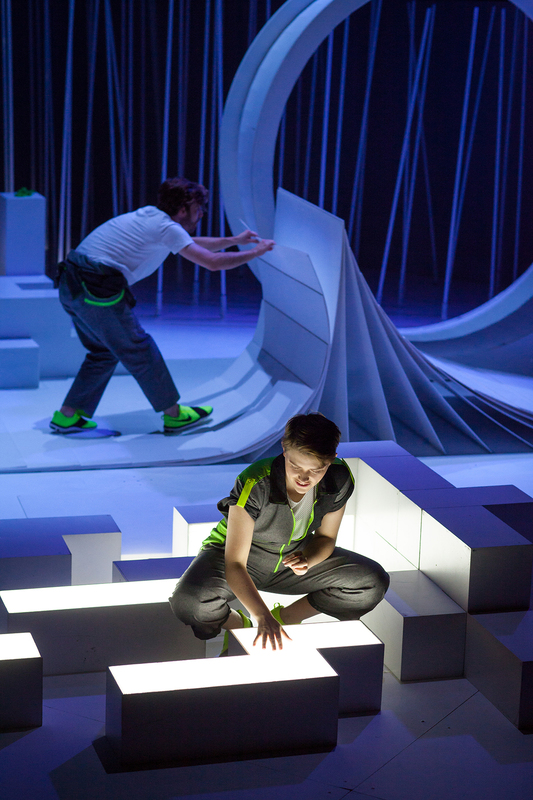 It seems as if every element of Jolyon James’ ever-moving set can be illuminated from within, and lighting designer Paul Lim and video designer Sean Healy further add to the sense that the physical environment on stage is as fluid as pixels on a screen. It’s the ideal space for a work exploring identity in the internet age, and the unfolding of the work is as jagged and disconnected as any other hour spent online. The bulk of the piece comprises an original series of spoken word works by a range of writers, given (often overlapping) expression by four performers. There are physical sequences that break up and sometimes continue through the oration, but the poetry here appears to be the foundation for the work. I don’t know that it speaks to its subject in a way that 2017 needs. A girl discovers that maintaining her digital identity takes all day, leaving her with no time to get things done IRL. A boy delivers a Fight Club-style tirade against social conformity, determining that “psychotic is someone who’s just found out what’s going on.” The internet opens up windows to the world, but it can also define the walls of our prison. While it’s visually lavish, the movement in the work is slow and measured, and conceptually it proceeds with just as much deliberation. The experience is one of contemplation, not distraction, giving it the air of a work grappling with the digital age when it was in its infancy rather than several decades down the track. I saw the work during a matinee full of school students, and I don’t know how much of the slam poetry married up with their own navigation of the digital world today — then again, I’m hardly the target for a work like this. It’s probably me that isn’t speaking to today. See a video interview with Garry Stewart here and read about his research here. Watch a video of Trapper in rehearsal here.